I was loaned this book by a friend and enjoyed it because I have not read enough on this important subject. I realize that there are a lot of viewpoints on the various aspects of forgiveness. 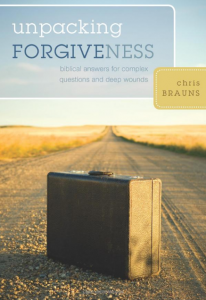 Brauns defines forgiveness in the first few chapters and repeats this definition: “A commitment by the offended to pardon graciously the repentant from moral liability and to be reconciled to that person, although not all consequences are necessarily eliminated.” In dealing with the controversial subject of responding to the unrepentant person, he gives three principles: 1) Resolve not to take revenge; 2) Proactively show love; and 3) Don’t forgive the unrepentant, but leave room for the wrath of God. Thus Brauns believes that since God doesn’t forgive the unrepentant, neither should we nor can we. He believes that forgiveness is not unconditional. This is not to say that the offended person shouldn’t move on to dealing with his own attitudes in the matter, but only that forgiveness takes two parties to complete.